President George H.W. 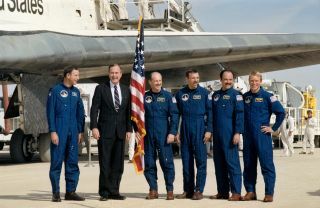 Bush poses with the crew of NASA's STS-26 space shuttle mission after the shuttle Discovery landed at Edwards Air Force Base in California on Oct. 3, 1988. NASA's chief Jim Bridenstine that the entire U.S. space agency is in mourning for President George H. W. Bush, who died in his Houston home at age 94 on Friday (Nov. 30). "NASA and the nation mourn the passing of President George Herbert Walker Bush, a leader who was a passionate advocate for space exploration," Bridenstine said in a statement Saturday. The goals set for NASA by Bush are the same ones the space agency faces today under the direction of President Donald Trump, who has ordered NASA to once again return astronauts to the moon. "President Bush's Space Exploration Initiative helped us to think big and long-term about space," Bridenstine said. "His impassioned vision of 'a journey into tomorrow – a journey to another planet – a manned mission to Mars,' helped sustain NASA's early work on the International Space Station, and it still can be felt in our ongoing efforts to send humans farther into the solar system to live and work for extended periods." Bridenstine said Bush was one of his personal heroes and a source of inspiration. "I remember like yesterday watching the 1992 Republican National Convention, learning of his life of sacrifice, and hearing his whimsical memories of 'sitting on an aircraft carrier, looking at the stars, and dreaming about a girl named Barbara,'" Bridenstine said. "From being the Navy's youngest fighter pilot in World War II and being shot down, to his years of public service in Congress, the State Department, CIA, Vice President and President, there was nothing he wouldn't give for our country and her people." Bush served as president from January 1989 to January 1993 following eight years as vice president under President Ronald Reagan. "The President noted it was humanity's destiny to explore, and America's destiny to lead," Bridenstine said. "We salute this great American leader, who challenged us to chart a course for the future to benefit all humanity."